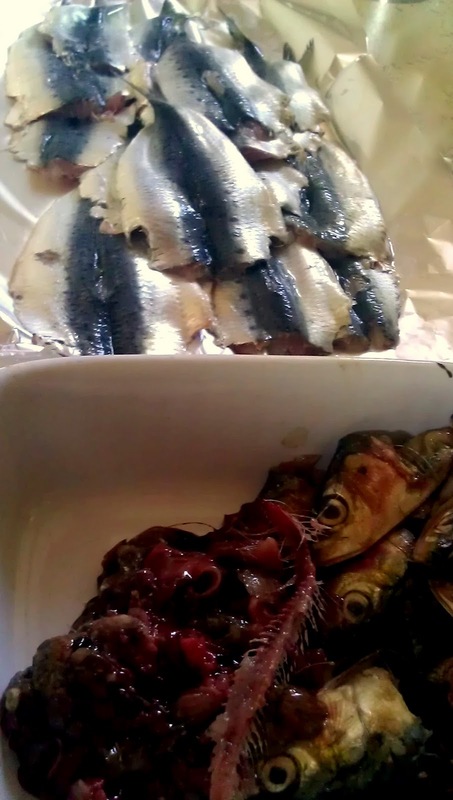 A few years ago, while on holiday in Italy, I ate fresh sardines for the first time. Before that I only had these little fish out of a can. Such a waste, because they're very tasty and versatile when fresh. And very hard to get. Sardines are not very popular in Holland. We eat the look-alikes (herring, raw and fermented) a lot, but not sardines, so the fishmongers hardly ever sell them. Last week I told my boyfriend how I would love to have some sardines again and the next day, while shopping at our local market, I saw them. A big pile of fresh sardines! How's that for coincidence (or was it fate...hmm...)? 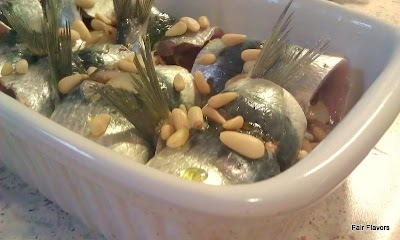 The sardines weren't cleaned yet and the sales people were very busy, so they couldn't do it for me. So I just bought 2 pounds and went home, figuring I could do the cleaning myself. Now, I have never in my life gutted a fish before. I've seen it done, I have filleted fish, but never cleaned one. First, I stared at the pile of dead fish for a few minutes, mustering up some courage. Then I watched this video (I really love Google and Youtube, it's so incredibly helpful!). Then I stared at the pile of dead fish again. Finally, I grabbed the sharpest little knife I had and gutted my dinner. The first fish was a little awkward, the second a little less awkward and by the third sardine, I felt like a proper fish gutting professional. I did it exactly like in the video: first cut all the heads off, then cut and gut them all and finally butterfly them. The only step I added was that, while taking the backbones out, I held them under running water, to make sure the blood was gone. It was a breeze. Really. Nothing to be squeamish about. I have to admit I even felt a little pride. For a proper primal experience I have to catch and kill them first, but this came pretty close. Still fancy a fish for dinner? :-) Then keep on reading. Half of the prepared fish I put in a bag to freeze for later use. The other half I used for dinner. With all the effort I had put into cleaning and preparing them, I didn't just want to fry them up. I wanted to do them justice and make something really nice. And it sure was nice. Preheat oven to 440F (225C). Heat some fat in a skillet and fry the onion and garlic until soft. Add the tomato, herbs, salt and pepper (to taste). Stir for a minute until is mixed well. Lower heat and let it simmer for one to two minutes. Add the bacon and turn off the heat. Put a sardine, skin side down on a work surface and put a table spoon of the onion-tomato mix on it (maybe a little less, it depends on how big the sardine is). Roll it up from head (well, where the head used to be before you brutally chopped it off) to tail. Repeat this with the other fish. Stack them in an (greased) oven proof dish. Give it a good drizzle of olive oil, a squeeze of lemon or lime, and scatter some pine nuts on top. Place in the hot oven for about 15 minutes. This also toasts the pine nuts, so you don't have to bother toasting them first.